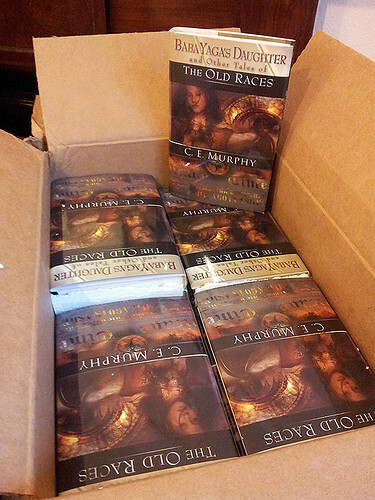 I got a GREAT BIG BOX of books in the mail today! This never gets old. I tell you, it just never gets old. This is my 20th book (if you count Chance as a book and include WINTER MOON/Banshee Cries in the lineup, which I do), and my first hardback book, and wow. I mean, wow. The hardback thing, that really got me. I knew it was, but knowing it and seeing it are v. different things. Wow. Wow. I thought it would take until the end of 2013 to do that, but, um, no, there it is, all filled up. A couple of them--NO DOMINION and YEAR OF MIRACLES*--aren't available to the public yet, but they will be...soon. January for NO DOMINION, and...I'm not sure when yet for YEAR OF MIRACLES. I don't want to overload the market in the first quarter of the year. Anyway, I believe today gets a Great Big WOW. Also I reached 26K on Nanowrimo today. *YEAR OF MIRACLES is, of course, available as the 3 e-book collections, but not yet as a POD physical book. Wow indeed. And yay! Those are lovely. OMG! This is your 20th book! And I got number 20! SQUEEEE!